Army Chief of Staff Gen. George W. Casey Jr. launches training Thursday on the repeal of the ban on gays in the military. Washington (CNN) -- All four branches of the U.S. military have begun the training required as part of the repeal of the ban on gays and lesbians serving openly in the armed forces, and expect to have it completed before the end of summer. All four branches are following a three-step approach to the training as the military works toward removing itself from the "don't ask, don't tell policy." The first part focuses on training experts -- service members responsible for the administration of the new policy such as chaplains, lawyers and recruiters. The second step involves training senior leaders, including the highest-ranked officers and enlisted men and women in the services. Finally, the rank and file troops will be trained. All uniformed military personnel and civilians in a position in which they supervise troops are required to undergo the training. The Marine Corps was the first branch to begin training and expects to be finished before the end of May, according to Marine Corps spokesman Capt. Brian Block. The Army started its training Thursday with Gen. George Casey, the U.S. Army Chief of Staff, leading many of his four-star generals through the guidance during a meeting at the Pentagon. It plans to complete training for all soldiers by the middle of August, according to a statement published online. The Air Force began its training this week and plans to have it complete by this summer, according to Maj. Joel Harper, an Air Force spokesman. The Navy began its training earlier this month and has set a goal for completion by June 30. 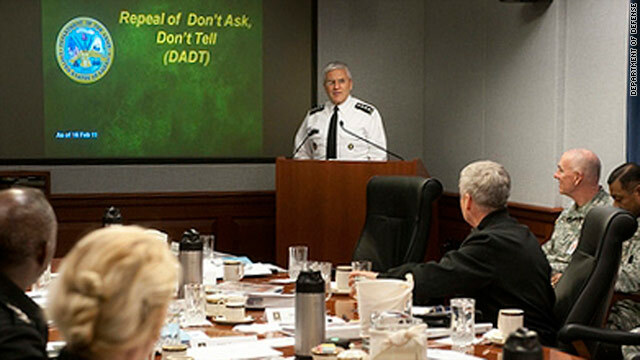 Many service members will receive their training via computer, including slides, narration, vignettes and frequently asked questions. Hypothetical scenarios are included in the curriculum and are used to question service members on how the new law should be applied in those situations. For example, a recruiter tells his superior that because of his religious beliefs he cannot process an openly gay recruit. The guidance suggests training, counseling and education should be the first course of action, but if the problem persists, the recruiter could face disciplinary action. The Defense Department has created more than a dozen such scenarios that could develop involving gay and lesbian troops. In each case, the emphasis on resolving problems focuses on the least-disruptive solution that keeps in mind not only the new law but also each service member's religious or moral beliefs. Spokesmen for the military declined to say when their branch's leaders may be prepared to tell Defense Secretary Robert Gates that they are ready to implement a repeal of the ban. At that point, Gates, the chairman of the joint chiefs of staff and the president will certify that the Defense Department is ready to implement the repeal, ensuring that the move will not negatively affect the military's ability to fight. Once that happens, there is a 60-day period before the law is repealed. Until then, the current ban remains in effect.